The Community Dance Company known as The Harlem Project brings professional dancers from Matthew Westerby Company together with the Dunlevy-Milbank Center of the Children’s Aid Society (Harlem), Covenant Ballet Theatre (Brooklyn) and children from the South Bronx, as well as an apprentice ensemble of high school and college-age dancers ~ culminating in a performance at the Richard Rodgers Amphitheater in Marcus Garvey Park. The Event will take place on Tuesday, August 14th at 6:00pm, with a pre-show Family Zumba Workshop. In addition, stay tuned for four pop-up performances around the neighborhood in the weeks leading up to the August 14th performance. Pop-Up on Saturday, July 28th at 2:00pm at the Hamilton Heights Weekend Walks Street Fair, 142nd to 144th Streets & Hamilton Place near Amsterdam Avenue. Saturday, August 4th at Noon on 110th Street & Fifth Avenue at the Duke Ellington Memorial ~ and at 1:00pm at 110th Street and 8th Avenue at the Frederick Douglass Memorial. Friday, August 10th from 4:00pm & 5:00pm at The Plaza/Uptown Grand Central! The Harlem Project is funded by the Lower Manhattan Cultural Council, the Upper Manhattan Empowerment Zone and NYC Cultural Affairs. 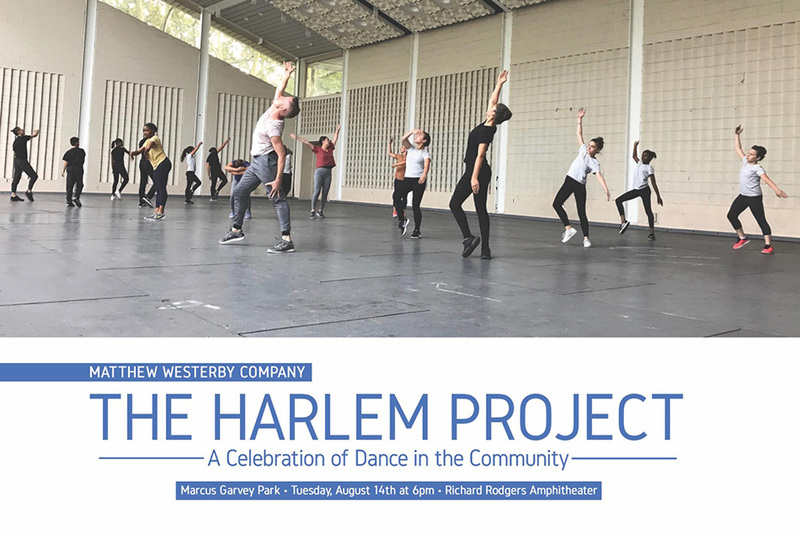 Enter the Richard Rodgers Amphitheater in Marcus Garvey Park at Fifth Avenue and 124th Street entrance. Stay connected to Marcus Garvey Park with the Marcus Garvey Park Alliance and the Public Art Initiative.